This project was commissioned as part of MAC – Midland Art Centre’s Women & Protest season Autumn 2017. I went a few times – a semi regular visitor I suppose I was. I was there for ‘Embrace the Base’…Not sure of the date – long time ago now …… 1982 or 3. 7 or 8 coaches came from Brum, from Colmore Row I think and one from Handsworth Girls school …. maybe a minibus from Women’s Aid, the Women’s Peace Centre. 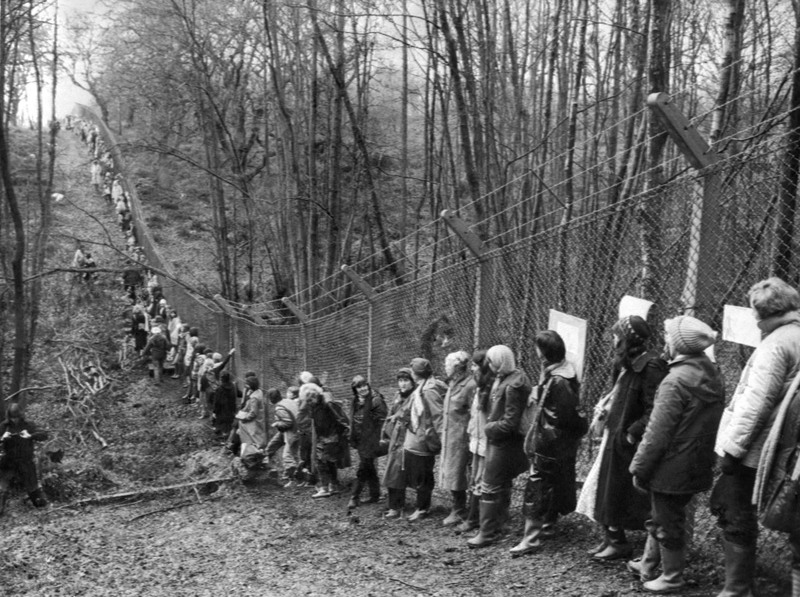 Definitely people from WANT – Women Against Nuclear Threat….. Can’t remember which gate – there were 8, it was in 1982 – or 83 – I can’t quite recall …..it may have been December as I think I remember snow – or did I dream that..? Developed from research interviews, Rocking the Wire is an engaging new production inspired by the experiences of Birmingham women at Greenham Common Women’s Peace Camp. Set in 2017, Rocking the Wire is told through the eyes of Deborah, who decades on remembers the women she stood with, sang with, and ‘embraced the base’ with; and reflects on how events at Greenham shaped her life and provided a legacy for young women’s activism today. The play explores ideas such as non violent direct action, life on the peace camp and the very real threat of nuclear war that hung over people in 70’s and 80’s. The piece was developed from interviews with women from Birmingham who were at Greenham Common. Premiered in MAC’s Hexagon theatre with minimal set, the performance blended audience participation and live music to tell the stories of five women with very different reasons for being at the peace camp. The piece allows audiences to explore the past and the legacy of Greenham Common but also make us think about the present, contemporary political protest and the importance of standing up for what we believe in. Commissioned by MAC and premiered as the finale to their Women in Protest season in Autumn 2017, this play is currently available for booking. Phoebe Brown, Janice Connolly, Emma Fall, Alex Simonet, Cassandra Wiggan.